Buddy Solitaire has a problem. A stand-up comedian who has grown up with it in his blood, he can’t seem to connect what he knows with how to make it funny. But that’s not really his problem; he really can’t admit that some of what he knows has damaged him as a person, and he can’t connect that with how to become a healthier human being. 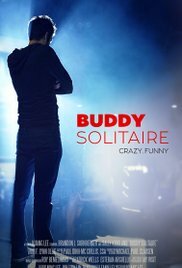 Buddy Solitaire, the film by writer-director Kuang Lee, travels territory that isn’t exactly new, but it also isn’t afraid to confront that even if Buddy (Brandon J. Sornberger) solves that problem, there’s still damage done. The son of an “almost was” comedian (Sally Kirkland), Buddy is charming enough; he just can’t help being self-destructive. The seeds may have been planted by his mother, who constantly tries to ruin his relationship with social worker Vanessa (Dominique Razon). It’s unclear if Buddy really even wants to be a comedian, or if he’s somehow working out his mother’s dream. When he takes a job teaching comedy to a therapy group at Vanessa’s center, he follows a familiar pattern. He wants to be good at it, he really does, but he’ll find a way to ruin it. Some of the group’s subplots work more effectively than others. All of the actors are solid and Lee doesn’t shy away from how tragic their backgrounds are. Despite occasionally cliched story beats, the interaction between Buddy and his students carries enough conviction and charm to make it work. Where the movie falters, though, is in delivering what’s “supposed to be” funny. Buddy draws from his experiences teaching to change up his act, and it’s just mean. Yet the audience at the comedy club laughs, albeit through vaguely horrified expressions. So you can see where the turning point is going to come, and the film’s audience’s cringing comes long before. But that might be part of the point — for a student of the art, Buddy seems so utterly artless in his own act. As a comedy, it doesn’t quite work. But as a drama about a comedian, it holds its own pretty well. The dynamic between Sornberger and Kirkland is painful, but Sornberger sells the dutiful son who just can’t admit that his mother’s love isn’t at all healthy. And though some of the emotional turns feel a bit rushed, all the actors make the connections work. Though covering familiar territory, the movie also has an insider’s detail that gives it more credibility. Buddy may not be a successful comedian, but he makes off-handed references that prove him to be part of the L.A. comedy scene. Lee told me he was intrigued by the healing power of laughter, as part of his inspiration for this film. There’s definitely truth in that, but I’d take it a step further: Buddy Solitaire really shows off the healing power of truly connecting to other people, even when it takes us in directions we don’t expect.